Earlier this month I attended a Body Shop event in Eldon Square, Newcastle and I thought I would show you the lovely goodies I came away with. Chocomania Beautifying Oil - This is the first item I picked up when I went into the store. I knew I wanted something from the Chocomania range, as it all smells incredible, and literally good enough to eat. I've really been enjoying using hair and skin oils lately, so this seemed like the obvious choice of product to try out. The oil is made using a lightweight blend of nut oils and can be used on the face, body and hair. I'm very excited to start using this... I'll try and get a review up in the next few weeks. Madagascan Vanilla Shower Gel - If you asked me to name my favourite scents, I'd definitely say vanilla is up there as one of my ultimate faves. I haven't used this yet, but I never have baths (showers FTW) so it's going to be really useful. I already know I'm going to love it. Ginger Anti-Dandruff Shampoo - I'm not a sufferer of dandruff, but my sensitive skin continues onto my scalp. A lot of shampoos which I have used in the past have made my scalp sore and itchy, which has led me on to trying anti-dandruff shampoos. They work really well for me, but I find that I have to use clarifying shampoo every week or so to make my hair feel really clean. I've only used this once so far, but it doesn't leave my hair feeling as weighed down as other anti-dandruff shampoos, and the smell is really refreshing. Strawberry Body Mist - I talk about my love of the Coconut Body Mist all the time, so I knew that I'd be picking up another one of these. I was stuck when trying to choose which scent to go with, but Ray helped me to decide on this one... it's so fresh and fruity - great for Summer. I've been wearing it on a daily basis since I bought it, and it has replaced my coconut one for now. In the long run, I think I'll go back to the coconut, as it's my all-time favourite, but this is lovely for a change. I apply these on top of my clothes... the scent definitely lasts longer this way, rather than applying onto the skin. If you're not a fan of these scents, I'd really recommend the satsuma and shea ones too. Vitamin C Skin Reviver - I wasn't going to buy this, but Daisy kind of convinced me that I need it, and I'm so glad she did... I've already been using this, and it's such a great product. I'm willing to give anything that claims to brighten my skin a try, I'm all about glory, radiant skin at the moment. I've been wearing this on it's own and under my makeup, and it seems to work really well as a primer, as my makeup stays in place really well on top of this. I'm so impressed with how soft and silky my skin feels after applying this, and you only need the tiniest amount of product, which is a bonus. Honey & Oat 3-In-1 Scrub Mask - I don't own any face masks, so thought that I would invest... this one sounded like it would be lovely for my skin as it claims to smooth, refine, moisturise and condition - if this is the case, I will end up loving this! It's a weekly treatment, so I'm going to try and get into the habit of using it every Sunday night after work as a bit of a treat and have some chill out time. It smells beautiful too! [Disclaimer; I received the shower gel in a goody bag, and the other items were all purchased using an exclusive discount at the event]. Oooh - let know if that scrub mask is any good! Really need to invest in one!! Ahhh looks like you had a very successful evening :P I really want to try the skin reviver :) I love all the body shop products they all smell so good! 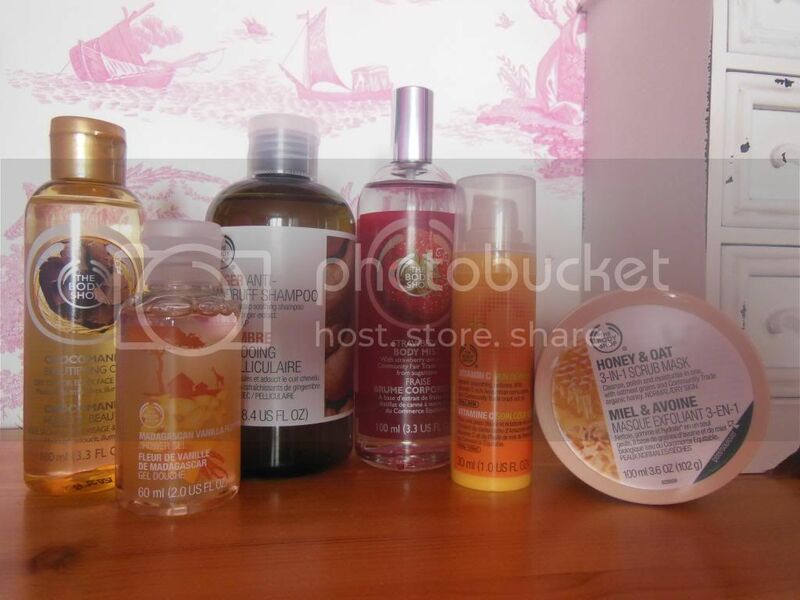 i love the body shop products as well!